Ideal for clinical settings, this unique, handheld reference provides the most vital details of assessment diagnosis and treatment in a portable, lay-flat format. The convenient organization with color-coded sections and information broken down into charts, tables, and lists makes it easy to find information quickly. With content compiled, created and reviewed by experts in PT practice and education, you’ll have all of the information you depend on for academic and clinical success in one convenient reference! Coverage of preferred practice pattern key areas - including musculoskeletal, neuromuscular, cardiovascular and pulmonary, and integumentary - prepare you for situations you’ll encounter in practice. Charts, tables, lists, and figures offer easy access to critical information, perfect for fast access in the field. Content on adult, pediatric and geriatric populations prepare you to provide the best care for each patient. 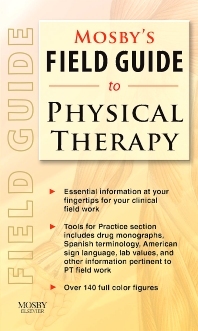 Drug monographs include essential information on drugs that may affect physical therapy intervention. Tools for Practice section features important tools for clinical use including content on vital signs, lab values, common ICD-9 codes, American Sign Language, Spanish terminology, and drug monographs. A vibrant, full-color, user-friendly design with over 130 illustrations and color-coded sections makes it easy to find and understand information. Convenient, take-along format lays flat for easy reference in the busy clinical setting. Faulty postures: Kyphosis-lordosis, swayback, and flatback compared with ideal alignment. Landmarks Palpated for Symmetry as Part of the Sacroiliac Examination. American Spinal Injury Association (ASIA) Standard Neurological Classification of Spinal Cord Injury. Rule of Nines provides a quick method for estimating the extent of a burn injury.